VIZ Media Launches "Sleepy Princess in the Demon Castle"
Princess Syalis is the princess of the human kingdom, “Goodereste.” She has just been kidnapped by the Demon King and is imprisoned in his “Demon Castle.” While the human kingdom goes into panic over their missing princess, the princess herself is… bored... and just wants to get a good night's rest. Sleepy Princess in the Demon Castle, Vol. 2 (Chapters 14 to 26) finds Syalis simply trying to partake of a good bath, but she finds the current facilities wanting. Will her search for the perfect bathtub, however, destroy Demon Castle? Also, the princess participates in a castle fitness challenge, befriends Ice Demons in order to cool off, and is carried around by a host of Teddy Demons who just want to be praised for pleasing her. THE LOWDOWN: The Sleepy Princess in the Demon Castle manga is super-cute and quite funny. Even the appearance of a single Teddy Demon makes sure of that. It is an episodic comedy in which each chapter offers a new comic scenario or situation. 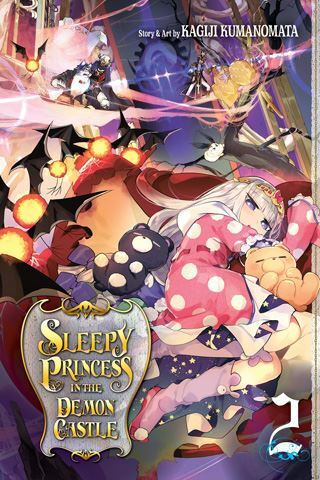 Sleepy Princess in the Demon Castle Graphic Novel Volume 2 offers a variety of comic scenarios... and several Teddy Demon appearances. One thing I missed in reading Vol. 1 is how really destructive Princess Syalis is. She is tearing Demon Castle apart and upending the lives of its denizens. That is what will keep this series going, even when readers grow a little tired of Syalis' spending just about every chapter trying to invent a new way to get the best sleep. Also, much credit to translator Tetsuichiro Miyaki and script writer of the English adaptation, Annette Roman, for finding humor in what is a text heavy manga. I READS YOU RECOMMENDS: Readers looking for odd manga comedy will want to try the Shonen Sunday title, Sleepy Princess in the Demon Castle.